Would you recommend Hire, by Google to a friend? Zack Liscio has used this product for one year. It must be amazing to work at Google and come up with names for your products. We all sit here, putting in hours of research, thesaurusing, mood boarding, and domain availability searching for a name that's passably sensical. At Google, people be like "We're making a tool to hire people, what should we call it?". "How about Hire". "GENIUS!". @wuss They can also bulldoze anybody else with the existing name or trademark. "Legal team, come forth!" @wuss hahah, we just made a maps app, how should we call it? "maps". Hire, not to be confused with Hired. Google is going strong into the recruiting/jobs space. 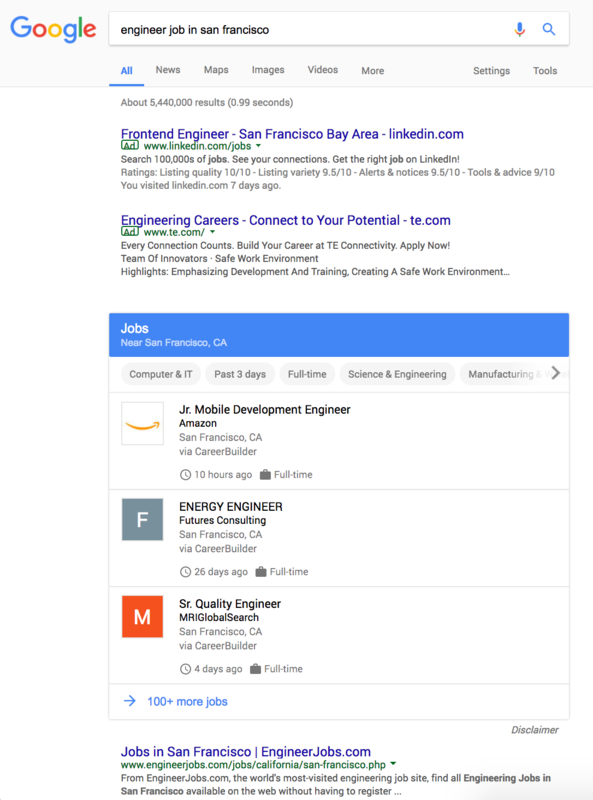 They recently introduced a jobs "card" within their search results. E.g. We are so excited about this - it would transform the entire recruiting experience in-house. Any ideas as to when this would go live on this side of the pond? With powerful offerings like Gmail, Calendar or Hangouts, Google is finding new (sometimes originally questionable) ways to direct people to those services. Hiring makes complete sense as it leverages a lot of existent G Suite products. The marketplace where tech companies compete to hire you!